Amazing blogger Robin is running her “~♥~♥~♥~28 Days To Be Thankful Giveaway~♥~♥~♥~ over at her blog. There are more than fifty prizes including gift cards and new release books. She’s offering dozens of ways to win, including listing what you’re thankful for this month. So please head on over to her website [here] and sign up to win one of those amazing prizes. Before you go, let me tell you what I’m grateful for this year. A few months ago, my mother was getting ready to move away. Most of her ten children, several relatives, friends, and grandchildren came to help. We joked, retold old stories, and made up new ones. 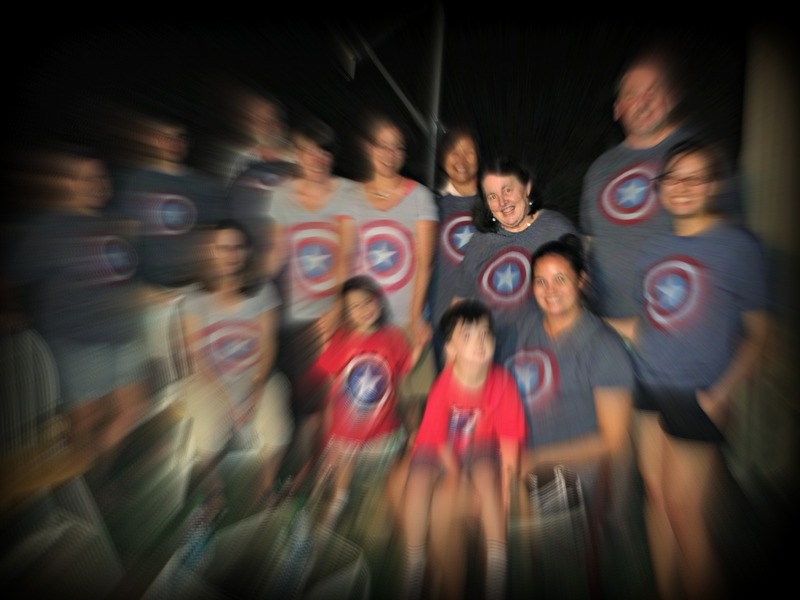 One sister didn’t bring enough t-shirts for the blazing California weather, so she bought a Captain America shirt. By that night, we had bought out the local Target stores‘ entire supply, dozens of shirts from XL to baby sizes. One brother-in-law called it “The Big Chill meets Waking Ned Devine”. We had a theme and a team uniform. Nights were devoted to marathon pinochle tournaments, late-night Baileys, and more stories. Each of us managed to have a special time to catch up with my mother. I told her about my new book, and she told me how proud she was. I told her what each of my children was up to, and she mentioned the role that genetics must have played in making each grandchild so incredible. By the end of the week, we had all said our goodbyes. All that was left was the big bon voyage party. The Southern California sun was unrelenting. No problem. One friend brought tents, and we set up misting sprinklers to cool the yard. Everyone who arrived was asked to bring ice, and coolers were filled. Friends and family came from all over the country, filling the house and yard with more stories, LOTS more Baileys, and so much laughter. So when we sit down to Thanksgiving dinner in a few weeks, what will I give thanks for? As always, I am grateful that with all the families out there, I got this one. But I’m also grateful that even though she’s gone and I miss her every day, my mother left us with the gift of saying goodbye with grace and laughter. And most of all, I’m just so very grateful that I was there for the most incredibly difficult thing that I wouldn’t have missed for the world. Thank you for sharing this, Barb. After all these years, it is such a joy to hear from you. The write-up about your parents brought back such memories. Every time we were together it was funnier than a comedy club. We remember your parents with so much love. I recall the time we visited them in Chicago and your mom was relating a story about the Jesus statue that your dad brought home. We were rolling on the floor with laughter. And the time we were playing bridge and your dad laughed so hard the drink he was consuming came out his nose! You called Fred the Cupcake Man because he would eat so many of the cupcakes you baked) We had an arrangement with your parents to take care of each others kids when we went away for the night.There were so many Figel kids and Vela kids that we had to take some of you to our house for the night. (It was divide and conquer).Then we would meet again for breakfast. One time your parents and ourselves were trying to get to mass on 9 first Fridays. When we showed up one morning there was no priest to say mass. Well, we were not about to break our string of masses, so a disgruntled priest came and did mass for his audience of four. We were so privileged to have counted Bob and Jenny as very special friends in a bond that will last a life time. PS. Would love to read your book. Congrats to you. I was laughing and crying as I read this. You’re right… SUCH great times! And how wonderful to hear from you again.